Trisha Traughber is a writer and teacher. Originally from California, she now lives in France. She loves reading and writing adventures. You can sign up for her Short Story Series or visit her website and blog here. Does it ever feel like you’re not quite ‘at home’ in English? After years of study, practice — maybe even of living and working in English — you’ve got a lot to be proud of. There are days when you look back to see how far you’ve come, and it blows your mind. You know what you need when frustration sets in, or when you need something new from your English? A different way of learning English — a change. and forget that you’re learning English at all. You need to try reading some short stories online — and doing a little creative writing of your own. Read on for 4 reasons to start today (plus everything you need to get started). #1 – Short Stories Are Inspirational — and Short! Have you ever tried to bite into a full-sized book in English … only to give up? Don’t get me wrong, reading books is a fantastic way to lose yourself in the language. And, if you find the right book, I know you can do it. But books can be intimidating — especially when you’re starting out. Why not practice with a few short stories first? Short stories are the same authentic literature — by many of your favourite authors. They just come in a smaller package. You can handle a short story. Even if you need to look up a few words, you know you’ll be able to finish it in one sitting. And once you’ve read a few short stories? I think you’ll find that it really boosts your confidence. Maybe you’ll feel ready to tackle a book next — if you want. There are so many free short stories online that you may not even know where to start! What a great problem to have. Let me help you with that — by suggesting just a few possibilities (easiest to more difficult). Looking for something super short? Here are 5 (illustrated) stories under 280 characters — from Electric Lit. Want easy short stories and book chapters to get you started? Try anything from Alexander McCall Smith’s Story Calendar. Why this particular author? His stories are authentic — by which I mean native speakers of English read them. And his writing style is one that’s friendly to anyone who is getting started reading fiction in English. And once you’ve read a few of McCall’s stories, you can easily graduate to any of his novels. Looking for a challenge? The New Yorker Magazine is a great source of literary fiction by some of today’s top writers. “The Lazy River” by Zadie Smith is a perfect example — and the New Yorker often has recordings of their short stories available to you. In fact, you can listen to Smith read her story here. #3 – Short Fiction Is a Conversation Starter! Reading is a fun activity you can do on your own and in your own time. But it’s also a perfect opportunity to join a conversation. Ever think of joining a book club? Some book clubs even offer short story discussions. These are a great way to use your English in a fun, lively and creative way; to force yourself to think on your feet; and to meet new people. You can start your own discussion group, join a local group or find one online. Not sure where to find a story discussion group? Consider signing up for this (free) Short Story Series — you’ll get an invitation to the Vagabond English Book Club, where we have monthly book chats and short story discussions. Who do you think writes all that short fiction online? Real people like you. What better way to breathe new life into your English habit than to start to create, play and innovate in the language? Writing is a fun way to start ‘thinking in English.’ If you make it a habit, it can help you find your words more easily or even weed out some of your most typical errors so that you can start sounding more natural — more like yourself. And there’s no pressure — you don’t have to start out by writing a full story. You can challenge yourself to write for 15 minutes a day, to have fun, to experiment with creative writing techniques. Ready to Get Started Reading (and Writing!) Some Short Fiction in English? Do you see yourself reading online fiction as a fun and relaxing way of immersing yourself in English? Have you ever attended a book club meeting? Would you try out a short story discussion? 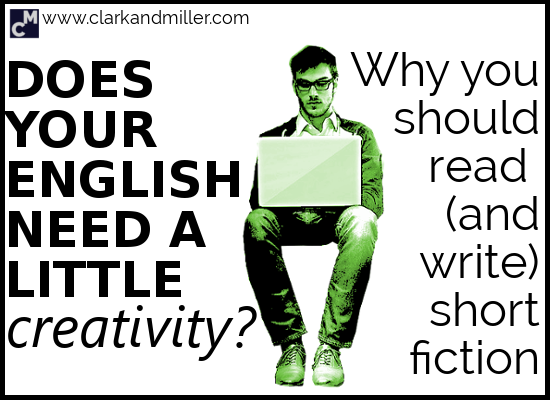 Can you imagine doing a little creative writing in English? If you have any comments or questions, leave them below — I’ll be checking in and would love to hear from you. And if any of this sounds like a fun and fresh way to try something new and different in English, I’d like to invite you to join the Short Story Series. It’s a short, free and self-paced email course with hand-picked short stories, and short and simple creative writing prompts. And, of course, you’ll get an invitation to our Book Club on Facebook — so you can join the conversation.